We love our customers and we love to get to know them. Every so often we come across a customer that is extremely talented! Roy Murray is part of the East Valley Barbershop Harmonizers Quartet and he offered to do a jingle for us! It is AWESOME. Check it out and learn more about Roy and his quartet. I have been a customer at RAD Auto Repair for almost 2 year’s now with having the care of both my Hyundai Sonata and Santa Fe. From the first step into the shop and receiving a warm welcome was the first inclination I was going to get good care and service on my vehicles and just so, The staff and Auto Technicians have always been genuine and provided quality care and given my vehicles the right work needed to repair and fix the problem at hand. 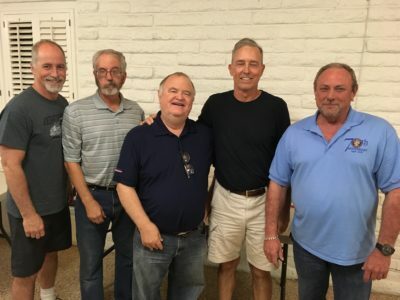 My name is Roy Murray, married and have lived in Arizona since 1984, without going into my employment history I accent on and focus on a hobby I’m very passionate about and that is A Capella singing, Barbershop style. I am a current registered Chorus member with the East Valley Harmonizers: www.evbarbershop.com and in a quartet named Saucebox. Although I had the 2016 Far Western Division Novice Quartet champs Quadratic Audio help me with the RAD jingle. We perform throughout the valley with special request for parties; wedding, funerals and have been known to do the national anthem at the coyotes and diamondbacks games, so you might recognize me. I am a very entertaining person as my friends know, I am so involved with Barbershop with my chorus chapter, quartet and being the marketing VP/PR I’m also apart of the Superbowl as a field team member helping in preparation for the pre, halftime and post for the NFL Superbowl.